�����Gold bullion broke through the $1,350 mark in morning trading, and with a solid Atlanta ANA now behind us, dealers and collectors are looking for even higher levels over the next few weeks. Gold is strengthening because of economic crises throughout the world, especially in the Ukraine. Without a quick fix, most analysts are sure the metals will remain actively sought. Many dealers reported steady sales through most of the ANA but buying nice material is still a problem. When fresh coins come on the market, sellers want strong premiums. This is problematic of a good market and has persisted for a long time, especially with more buyers in the market. �����Heritage Auctions hosted the ANA Sale and the results were exceptional for truly rare coins. Leading the list of highlights for Lincoln Cents was the 1909 S VDB in MS67 Red. This was a PCGS coin and is the highest certified by either service. 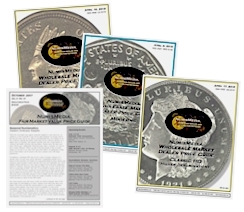 There are a total of 12 coins certified with PCGS grading 11 of them. 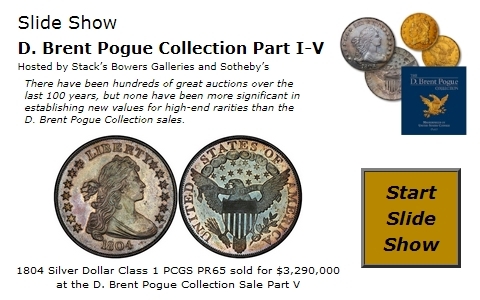 This one brought $117,500 and there is already a dealer on teletype looking to purchase another coin for the under bidder. It just shows that coins of this nature could sell multiple times if available. The list below shows some of the many highlights from this sale. 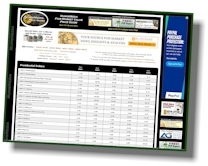 �����With the metals moving higher, this week�s Moderns Wholesale Market Dealer Price Guide posted numerous gains for related metals. The majority of Modern Eagles are higher in most grades with the Proof Gold Eagles advancing the most. One ounce Gold Eagles are up to $1,600 Market in PR69; with this morning�s surge, they are even higher by about $20. Buffalo Gold is very active with buyers looking for original coins and certified in MS & PR69 and 70. Availability of Buffalo Gold is very thin with many more buyers than sellers.